Are you looking for the most comprehensive HGV training Southampton has to offer? With pass rates above the national average, our friendly DVSA accredited instructors at Wayside Transport will teach you everything you need to know to become a confident HGV/LGV driver. Whether you are a company looking for extra training for your staff or you want to invest in our Southampton HGV training for your career, we will tailor our services to you for the best results. At Wayside Transport, we offer comprehensive courses for Southampton HGV training. The HGV licence is also known as Rigid, Class 2 or most commonly LGV, which is now the recognised term. Our LGV training course is open to anyone who passed their driving test after 2007 and is now looking to become qualified to drive a heavy goods vehicle of over 3,500kg. Our friendly team at Wayside Transport will help you every step of the way by providing the necessary D2 and D4 forms you require, as well as recommending a doctor for your medical assessment. Once you have received your provisional licence from the DVLA, you’ll be all set to start your HGV training in Southampton. View all of the official requirements to learn about the steps to getting your Southampton HGV training licence. Each of our instructors will ask you to take an initial driving assessment which allows us to tailor our Southampton HGV training to your level. Once we see your current standard of driving, we will be able to advise you on the amount of training you will need to pass. We offer different courses depending on the type of training you require. If you are an organisation looking to train up new drivers, Wayside Transport can help learners develop into highly skilled, responsible drivers that are prepared for employment in your organisation. Dependent on the environment, we can often carry out training on your premises but if this is not possible, we have a site in Ferndown, Bournemouth where we can provide results-driven training courses. You can also send members of your organisation to Wayside Transport to be trained by our instructors as an assessor. The assessor of your organisation will be fully-qualified to manage and review your driving fleet to ensure they are up-to-date with the latest safety regulations. This is a cost-effective way to ensure all your drivers are continuously receiving Southampton HGV training through the designated assessor. This will also increase the safety of your fleet and reduce the risk of accidents. HGV training Southampton courses are also open to any individual who wants to realise their career aspirations. Becoming a qualified LGV driver can provide an income of up to £30k per year and drivers are currently in high demand. 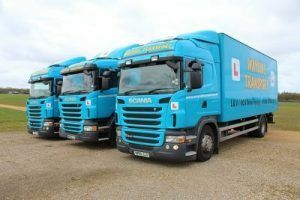 We have test centres for HGV training in Southampton and Poole or we can find a test centre that’s more local to you. If you are already a competent and fully licenced LGV/HGV driver, then why not pass your skills on to others. We provide the best HGV training Southampton has to offer for instructors. Our instructor training is a one-to-one course over 10 days that will cover everything you need to know about becoming an instructor for HGV training in Southampton and prepare you for the Instructional Ability Test. All of the instructors at Wayside Transport are DVLA certified and have a friendly, down to earth approach to Southampton HGV training. We tailor our services to your learning style so that you are able to pass confidently. Your instructor will always provide honest advice on how to improve your driving so that you can gain as much knowledge and experience as possible during your HGV training Southampton sessions. To view more information about our Southampton HGV training courses and other courses listed above, be sure to browse the rest of our website or click on the link above. All courses are designed to train your organisation’s staff to the highest standards in the most cost-effective and time-efficient way. Our courses and instructors are all recognised by the Driving & Vehicle Standards Agency and Driver CPC, so you can rest assured you are investing in the finest quality HGV training Southampton has to offer. To see how our previous learners got on, take a look at our testimonials. If you are not sure what Southampton HGV training course is right for you, don’t hesitate to get in touch with our expert team who can provide you with more details to pick the right style of HGV training in Southampton. For the most comprehensive HGV training Southampton has seen, contact Wayside Transport today. Call us on 01202 873 911.